Join us on a tour of Ireland’s southwest corner to discover a rugged landscape of jagged cliffs, sheltered bays and peaceful coastal towns. Based in Rosscarbery, on the lovely West Cork coastline, you’ll head out each day on four unforgettable excursions, visiting the likes of elegant Bantry House, the lively city of Cork and the pretty harbour town of Kinsale. You’ll also enjoy a boat trip to the renowned gardens on Garnish Island, and take a spectacular drive through the astounding landscapes along the Ring of Kerry. Fly to Cork Airport, meet your Tour Manager and transfer by coach to your hotel in Rosscarbery. Depending on your arrival time, you’re free to spend the rest of the day exploring this pretty village or perhaps taking a walk along the estuary – a bird watchers’ paradise. Our day begins with a drive through Clonakilty, birthplace of Irish hero Michael Collins, before we reach the village of Timoleague, where the ruins of its 13th-century abbey stand proudly at the water’s edge. The abbey is one of very few early Franciscan foundations with extensive remains still standing in Ireland. From here we’ll continue to the attractive harbour town of Kinsale, where a maze of narrow streets lined with galleries and shops are overlooked by its mighty 17th-century fort. Enjoy lunch with a view at the quayside (payable locally), where you’ll find a wonderful choice of cafes and restaurants. 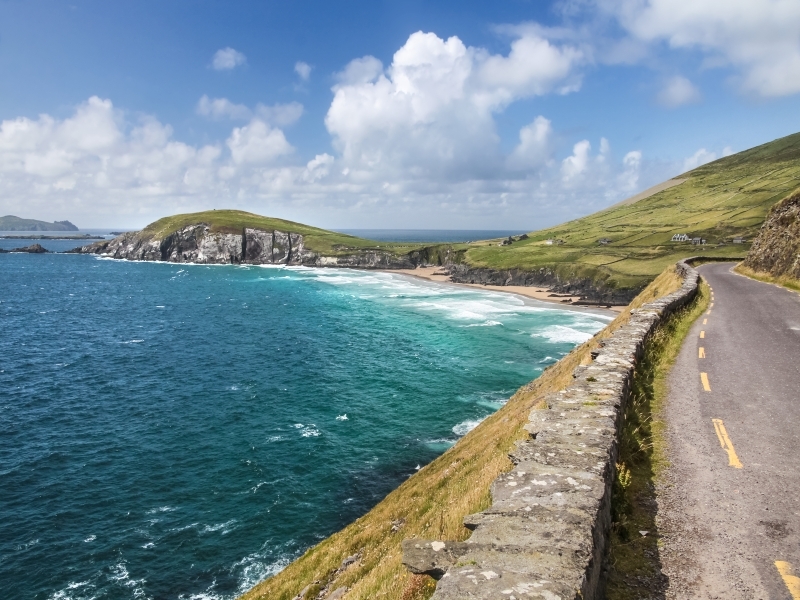 Travel along the celebrated Ring of Kerry, part of Ireland’s Wild Atlantic Way, on today’s spellbinding journey. Stretching west from the picturesque town of Kenmare, this 110-mile circular route around the sublimely beautiful Iveragh Peninsula takes in a concoction of charming towns and rugged landscapes of forests, tumbling waterfalls and the raging waters of the Atlantic. During the day we’ll cross soaring Coomakista Pass, catch sight of the monastic marvel of Skellig cast out in the sea, and have the chance to explore the pretty towns of Waterville and Cahersiveen. This is a long but truly memorable day, which for many may well be the highlight of the holiday. We’ll enjoy a change of scenery today, as we head into the city of Cork. This lively city is built on an island in the River Lee and is comprised of waterways linked by small bridges, Georgian avenues and rows of colourful painted houses. Don’t miss the triple-spired St Finn Barre’s cathedral and the English Market, where you’ll discover an astonishing array of fresh produce. In the late morning we’ll head to the historic and delightful seaside town of Cobh, the departure point for over three million Irish emigrants and the final port of call for the ill-fated RMS Titanic in April 1912. After time to enjoy lunch we’ll visit the excellent Heritage Centre (entrance fee payable locally), where a multi-media exhibition tells the emotive story of Irish emigration through to the 1950s, and traces the town’s history back to the 1600s. Enjoy the highlights of Bantry Bay on today’s captivating journey. We’ll begin with a guided tour of Bantry House, the ancestral home of the Earls of Bantry, and still lived in by the family. This grand building overlooks the bay and is set in magnificent Italian gardens inspired by the travels of the second Earl. Later, we’ll set sail on a short boat trip across the bay to Garnish Island, famous for its pretty walking trails and beautiful gardens, where flowers bloom from May right through to October. As we cross the bay, keep an eye out for resident seals, often sighted on the banks of Seal Island.